“Do me a favour. When ye walk around here to take them photos just say ye left the cheque around with Tom”. Some man for one man. Patrick Harris is a Jarvey. That is a man with a horse and carriage for those that don’t know the profession. While few may not know the term, in this city, everybody knows the profession. It’s part of the heart of the inner city that makes Dublin so special. He works at the Guinness storehouse ferrying tourists around Dublin city. Like many of the old trade jarveys, its very much a family trade. He started around 8 years old. He moved back and forth between building work and driving until the recent recession hit and now is a full time driver for the last 10 to 12 years. “There was always horses in the family. My mother and her sisters would make trips into the countryside with a donkey and cart to pick shamrock for St. Patrick’s Day to try to make a living”. As anyone who works with animals will tell you, they become your alarm clock. A typical day for Pat starts around seven am. He feeds and waters Christine, his seven year old mare and partner in crime, washes her and gets her bridled. 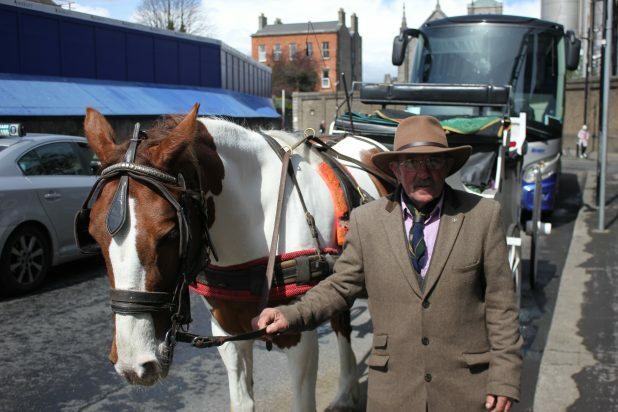 He leaves his stable on North King Street and heads over to the rank at the Guinness Storehouse where he works during the brewery’s opening hours ferrying people to the St Stephen’s Green, Kilmainham Gaol as well as others. Some days can be busy. Some days, he must sit there, reading the paper and hoping for the best. It’s just like the taxi industry. Nothing guaranteed. You could be busier on a wet day than a dry day. It can be variable. The last few years he’s seen more tourists in the winter season. But again, it’s variable. Patrick’s profession is not only part of the heart of the community, his actual heart is there too, He’s done a fair bit of charity work for Temple St. Hospital. “Running all my life. 40 years. I ran 29 marathons including London in 1990. Set up the Barn Dance when I couldn’t run anymore. I need new knees”. At his stable he hosts a Barn dance on the last Sunday in August. He had Jim Kelly, brother of Luke, sing one year but can’t guarantee players of that calibre due to the number of fleadhs going on. But can guarantee hay, horseshite with plenty of drink and craic. His stable was a holding pen cattle yard then a steel works.”Smithfield was full of pig and cow yards. no markets on Sundays. Mondays to Wednesdays only. There was abattoirs everywhere and butchers. There was a large abattoir up at Doyle’s corner. I’d go down and give the men a hand with the cattle to get a thruppenny bit of meat. All long gone now. The Yard will be sold in the next year or two. You can’t stop progress. The line of work could be gone completely in the next 20 year unless people organise properly”. “Dublin City Council is trying to kill the game and get us off the road. They don’t want the horses in Dublin. They’re introducing new bye laws increasing the Annual carriage licence up from €15 to€ 500 and the Annual drivers licence from €15 to €100 and different public liability???? Which could increase insurance costs up to €2000 a year. Where are we going to get that? I don’t know when and I’ve been trying to meet with them. 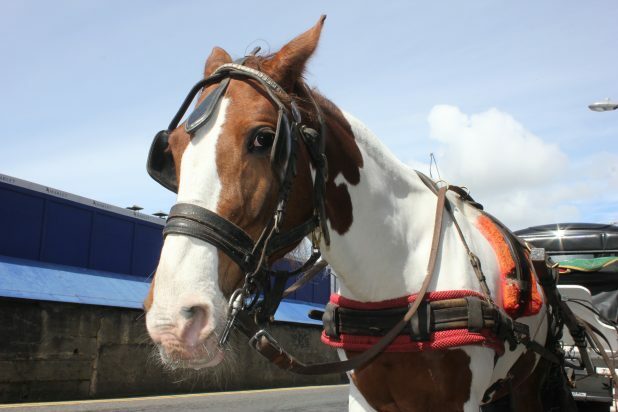 There are only 3 horse ranks in Dublin and there are 16 or 17 legit drivers. Our relationship with Guinness is good and they could talk to us if we had the right committee and if we could set a dress code. Done properly it could be an even bigger draw to tourism. In return we’d look for some kind of assistance to keep this profession alive”. Dublin City Council have an historical legacy of building over a past (quite literally in the case of Wood Quay), these trades make up the frabric of our community and with fair regulation and a touch of aesthetic, they can really make our capital stand out, lets hope Paddy can organise his fellow jarvies and protect this wonderful service. Very interesting article. Well done on raising awareness of the predicament of Paddy and the other licensed jarvies. I hope they can get the support they need to preserve their profession.